A sequence of strange, striking scenes opens The Long Earth. The most unique among these, and certainly the most poignant, is a solitary childbirth—a childbirth so solitary that, for a brief moment, the new-born child is the only conscious being on Earth and possibly, the Universe. It would later transpire that the mystery of this birth is the key to understanding the relationship of a major character to the novel’s mythos. Later in the narrative, a very similar childbirth occurs, only this time the roles and positions of the mother and child are reversed. And it is as funny as it is poignant. The Long Earth is the kind of speculative fiction that I like to call ‘fantasy spun around an idea.’ Such works do not weigh themselves down by trying to explain how the concept or framework of concepts that drives the narrative works; instead, they are primarily concerned with exploring its possibilities and consequences. They pose questions and formulate answers within and consistent with their constructed conceptual frameworks. Typically, the idea at the heart of such a framework is obtained by posing a what-if question and answering it with a yes. 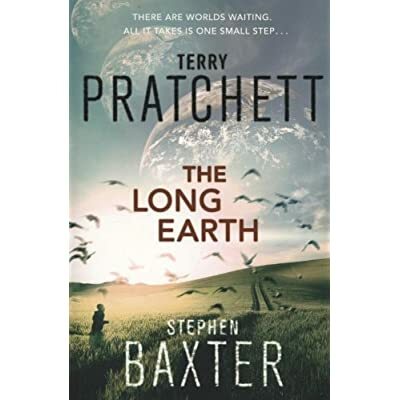 And in The Long Earth, Terry Pratchett and Stephen Baxter’s what-if question is this: What if humans could step into an infinite progression of alternate Earths in an infinite progression of alternate Universes by, literally, just taking one step after another? They then go on to examine the scientific, historical, social, cultural, economic, and political ramifications of the altered, expanded sense of reality that such a possibility opens up. Along the way, they pose some interesting questions and formulate fascinating and, occasionally, surprising answers: Would this ability [to ‘step’] be innate, aided, or completely artificial? If innate, then could it be a product of the evolution of human sentience? If so, could ancient humans have ‘stepped’? If it is indeed a product of evolution, then is it not probable that a small fraction of the human population would not possess this ability? Are humans the only sentient beings in this ‘Long Earth’? If not, then is it not possible that these other sentient beings could ‘step’ too? A supposedly crazy scientist, Willis Linsay, invents the ‘stepper,’ a deceptively simple, easy to make contraption that helps people ‘step.’ Soon, for reasons not very clear, the stepper’s design is out on the internet. Joshua Valienté, a young orphan living in Madison, Wisconsin, is the first person to step on the so-called Step Day—the day thousands of people, mostly children, step ‘left’ to the first in an infinite sequence of alternate Earths. Almost immediately he realises something unique about himself: he doesn’t feel one bit uncomfortable about stepping, unlike the others, who grow sick and throw up. What’s more, he realises he does not need a stepper to step. As Joshua grows into adulthood, spending more and more time travelling deeper and deeper into the solitude of the so-called ‘Long Earth,’ a new kind of sentient being is discovered on ‘Datum Earth’ (our Earth): Lobsang. Lobsang, it turns out, is the disembodied consciousness of a Tibetan motorcycle mechanic, who has become a transcendent sentient being with his immense consciousness distributed across multiple electronic storage systems. He holds large stakes and great clout in the rather mysterious Black Corporation. Lobsang decides to explore the mysteries of the Long Earth by journeying into it faster and deeper than ever before and coerces the now adult Joshua into joining him on this extraordinary voyage. They undertake the journey in a specially designed airship, called the Mark Twain, in which Lobsang is both voyager and ship. Literally! On the way, Lobsang tells Joshua about other sentient ape-like beings in the Long Earth, in particular the ‘Trolls.’ The Trolls, it turns out, are gentle social beings capable of stepping and communicating along almost the entire length of the Long Earth. Surprisingly, for hairy ape-men, they communicate through songs sung in perfect, elegant harmony. Songs are their collective memory. The Trolls, of course, are only one among many wonders that Joshua and Lobsang encounter. However, they soon realise that all across the Long Earth Trolls are behaving in a strange, mysterious way: all of them are stepping ‘right’ in large groups, apparently fleeing something, perhaps a catastrophe of some kind. Solving this mystery, Joshua and Lobsang decide, would be the goal of their expedition. Along the way they encounter other unexpected surprises—some fascinating, others troubling, and still others downright dangerous. They also bump into Sally Linsay, Willis Linsay’s daughter, a natural stepper like Joshua, who has her own secrets and stories to recount. She, however, is also troubled by the exodus of the Trolls. In search of answers, she leads them to a place deep inside the Long Earth known as Happy Landings. Happy Landings is an impossible place—impossible not because of what it is, which is a strangely peaceful community of Humans and Trolls, but because of how it came to be. I will not say any more, for fear of spoiling it for everyone. Suffice it to say that they do not find answers at Happy Landings, though in and of itself it remains a tantalising mystery. For that they would have to journey far deeper. And when it comes, the answer is as fascinating as it is surprising and very much consistent with the mythos built up until then. Let me just add one other detail: the circumstances of the childbirth scene from the beginning of the novel holds a clue. Back at Madison in Datum Earth, a long-time friend of Joshua’s, Police Officer Monica Jansson, watches nervously as a movement known as Humanity First takes frenzied hold among the non-steppers, people who are incapable of stepping. Things do go out of hand, culminating in a violent act of terrorism. This hints at the kind of themes that Pratchett and Baxter wish to tackle in their sequel, The Long War. I do hope, though, that in tackling larger political themes they would not lose sight of the pervasive sense of sheer wonder and mystery that makes The Long Earth such a joyous read and a great novel of ideas. This entry was posted in Book Review, Book Review: Fiction, Books, Notes on Literature, Notes on Writing and tagged book review, Books, Fantasy, Joshua Valienté, literature, Lobsang, Reading, sci-fi, Science Fiction, Stephen Baxter, Terry Pratchett, The Long Earth, The Long War, Writing. Bookmark the permalink.